Following the road south out of Cooktown for 12 kms will bring you to the Archer Point turn off. Follow the dirt road for a further 6 kms and you reach the beach where you can find some limited camping. Beach launches are possible with a 4WD drive. To get a good feel of the area go up to the lighthouse but hang on if it’s windy. During the winter months there are frequent sightings of breaching humpback whales. With town so close for amenities this is an ideal spot to have that camping, fishing, and family experience. Visually, it’s fantastic, fringing reef, sand flats, small tributaries, the wet tropics. Tropical Islands scatter this coastline and many are accessible by small boats when the weather allows. Some like Lizard Island are big enough to house luxury resorts, airstrips and camp grounds whilst others are relatively small. Camping is allowed on quite a few but booking in advance is necessary with QPWS. Strict regulations are in place to protect these stunning locations and for further info contact GBRMPA/QPWS for zoning maps and camping restrictions. Going in by chopper to that secret billabong, inaccessible headland or hard to access river mouth has to be one of the ultimate ways to travel and fish. 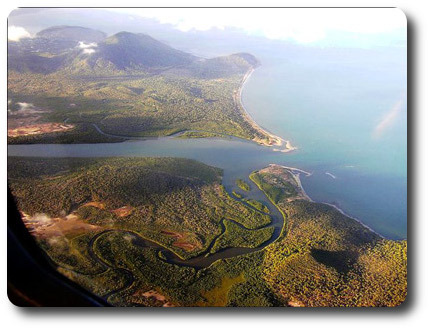 Getting there is usually very quick and spectacular, flying over dramatic escarpments, stunning rainforest and the Great Barrier Reef. Flooded bridges and corrugated roads are no longer a problem and multiple fishing locations are possible in one day. This surely will ensure a very memorable experience of fishing far north Queensland. Half day charters through to extended holidays are available with several local companies offering packages for that once in a lifetime trip. Unlike many spots along the eastern seaboard of the Great Barrier Reef Cooktown is the closest town to this iconic world heritage site ensuring your fishing time is maximised and not spent travelling. Inshore reefs lie just a couple of miles out and even though they are close shouldn’t be overlooked. However, travelling 10-15 miles out will certainly open up a lot more possibilities. Fishing the reef is fairly straightforward usually it’s a matter of working out which way the current is running onto the face of the reef, (pressure point) where the majority of predators and baitfish will be and dropping the anchor so that you hang close to these marks. Baits such as pilchards and squid work very well but those anglers wishing to experiment with soft plastics and jigs can also be rewarded with a multitude of species. If however you want to chase red emperor and nannigai then a different approach is needed. These fish tend to school up in deeper water usually over rubble patches, raised areas or around old wrecks so whilst your trolling around for Spanish mackerel keep your eyes on the sounder and when you see some life mark it on the GPS and return later. If you are new to the area then nautical charts are great things to study and will give you enough clues to catching fish if you study them carefully. Zoning maps can be obtained from GBRMPA. 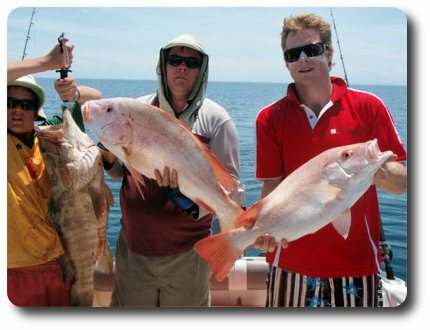 Whether you choose light or heavy tackle Cooktown with its close proximity to the reef and the continental shelf offers the angler a world class destination. The variety of species on offer is outstanding especially when you consider how far you don’t have to travel to catch them. From September to December the marlin fleet from across the globe, converge on far north Queensland. Many choose Cooktown as their base, chasing the elusive 1000lb (Grander) black marlin and to fish the Annual Lizard Island Classic. 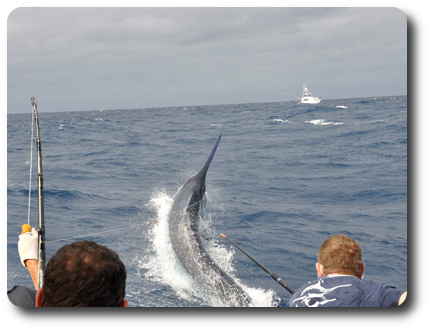 It is during these months that big female marlin with their attentive males, are brought down the currents on the outer reefs feeding on the ample bait supplies. This provides the angler an opportunity to target these leviathans from the deep. River and Estuarine: barramundi, mangrove jack, fingermark, tarpon, queenfish, trevally, salmon, cod, bream, grunter, flathead, jungle perch, sooty grunter. Barramundi closed season; 1st November, midday – 1st February, midday.